The Lumber River flows through the south-central portion of our state. And, the river's headwaters are in Montgomery, Moore and Scotland counties where the waterway is known as Drowning Creek. The creek becomes a river at SR 1412/1203 along the Scotland-Hoke county line, and its waters flow into South Carolina, eventually joining the Little Pee Dee River. 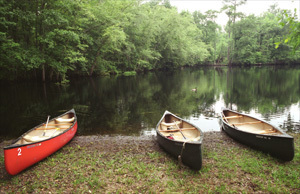 Lumber River State Park contains 7,936 acres of land and 115 miles of state natural and scenic waters, 81 miles of which are also designated national wild and scenic waters. The park's recreation activities are currently centered at the Princess Ann Access, which includes a reverse flow area named Griffin's Whirl. At the access, a bend in the river opens to a long, straight vista that beckons paddlers to take a ride. Note: Due to the fluctuating water level of the Lumber River, canoeists and boaters should exercise caution in planning trips on the river. Add extra time for crossing exposed hazards and sandbars. All float times should include additional time to reach take-out points.